Hepatocyte Specific Antigen, also called Hepatocyte Paraffin 1 or HepPar1, localizes to the mitochondria of hepatocytes. Hepatocyte Paraffin 1 or HepPar1 localizes to the mitochondria of hepatocytes. It is a sensitive marker for distinguishing hepatocellular carcinomas (HCC) from other metastatic carcinomas as well as cholangio-carcinomas. HCC s occur primarily in the stomach, but they are also found in many other organs. The Hepatocyte Specific Antigen may also be a useful marker for intestinal metaplasia. Reportedly, strong expression of the Hepatocyte Specific Antigen correlates with smaller tumor size and longer patient survival. Occasionally, Hepatocyte Specific Antigen is also found in gastric carcinomas as well as in a few other non-hepatic tumors. 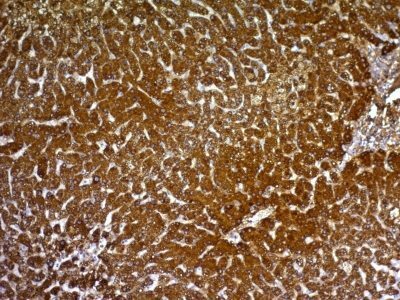 Catalog number key for antibody number 0966, Anti-Hepatocyte Specific Antigen (HepPar1) The prefix indicates conjugation, followed by the antibody number and size suffix.